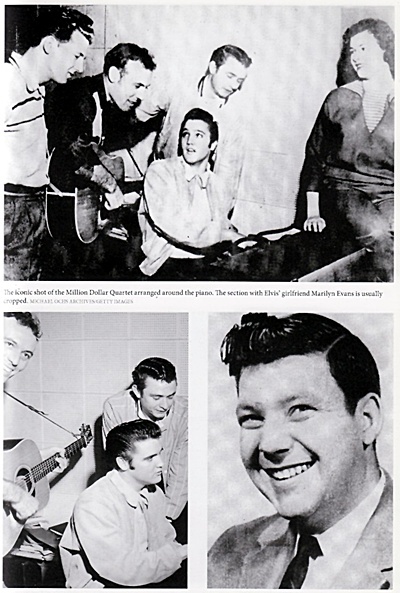 From the book's publicity .. 'The Million Dollar Quartet’ is the name given to recordings made on Tuesday December 4, 1956 in the Sun Record Studios in Memphis, Tennessee. 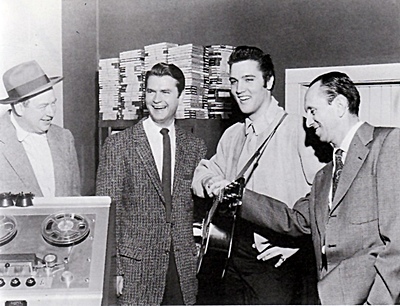 The recordings were of an impromptu jam session among Elvis Presley, Jerry Lee Lewis, Carl Perkins, and Johnny Cash. This book by Stephen Miller includes interviews with the drummer and the sound engineer. A detailed analysis of the music played – and its relevance to subsequent popular music. 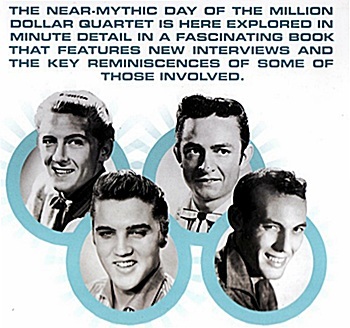 The early lives and careers of the quartet – where they were in 1956. Relevant social and economic factors which meant that a massive audience of young people were keenly looking for a new kind of music they could call their own. The “reunions” of surviving members of the quartet. The emergence of the tapes, first on bootleg and then on legitimate CDs. The genesis of the stage show and its reception – the enduring appeal of the music. EIN book reviewer Susan MacDougall explores this detailed look into a jam session that Elvis fans all know so well... is there more to discover? The Million Dollar Quartet : Jerry Lee, Carl, Elvis & Johnny by Stephen Miller. Omnibus Press, London, 2013. 256 pp. .. ISBN 978-1-78018-514-3. British author Stephen Miller’s interest in popular music, and country music in particular, prompted his separate biographies of Johnny Cash, Dolly Parton and Kris Kristofferson. 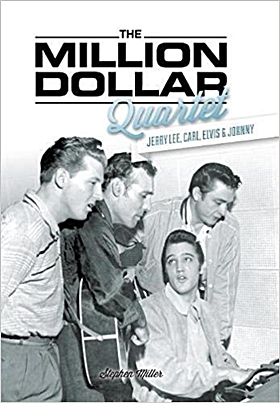 In The Million Dollar Quartet he documents the chance meeting of Jerry Lee Lewis, Carl Perkins, Elvis Presley and Johnny Cash at Sam Phillips’ Sun Studio on 4 December 1956 and the resulting jam session. Carl Perkins had been at Sun to lay down acetates for song releases. After his session, the recorders were turned off. At some point later, sound engineer "Cowboy" Jack Clement decided to start the tape during the jam session, providing a rare historic record of an exciting occasion. It didn’t change the direction of the history of rock and roll, but it documented a significant meeting of all the players. Stephen Miller’s writing style is easy reading but somewhat lightweight and repetitive, and despite the excitement of the events taking place not very emotionally involving. Although The Million Dollar Quartet has no index, it is set out such that the chapters explain the contents. There is a chapter on Sam Phillips, then a chapter on each on the four artists. Chapter 6, called December 5, 1956, is an account of the session itself; Chapter 7: The Songs; Chapter 8: Reunions; Chapter 9: Subsequent Careers; Chapter 10: The Musical Stage Show. It’s a bit unclear why the artists are listed in this order: Carl Perkins, Jerry Lee Lewis, Elvis Presley, Johnny Cash. 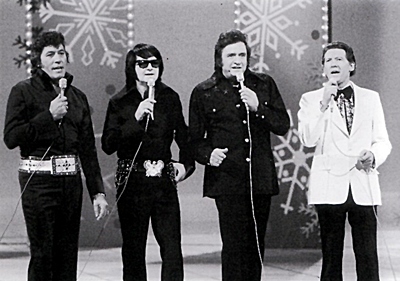 In career order, Sam recorded Elvis first, then Carl, then Johnny, then Jerry Lee as a late starter. But maybe it’s partly to do with the relative success of the musicians. Carl’s career lost momentum after a serious car accident and failure to have further great hits; Jerry Lee’s career was set back severely by publicity in Britain of him having an underage wife. This scandal followed him back to the United States. All four had an impoverished, religious background with some guilt about their wild lifestyles with womanizing, drug/alcohol taking. They started as poor whites working alongside poor blacks and listened avidly to their music, as well as to that of poor whites - heartfelt songs about hard times, love and religious faith. Elvis and Johnny had the best career successes, so maybe that’s why they come last. Under Chapter 9, Subsequent Careers, the four artists are each covered by a section under their individual names in the same order as in the chapter headings. There is some duplication of information between these chapters and sections, and throughout the book. This could be a bit annoying. Miller provides various quotes without supplying references to his sources. There is, however, a short list of Further Reading. The book includes 35 photographs, mainly of the SUN era and plenty with Sam Phillips but also continues to the "Class Of '55" 1985 reunion - with the final photo being Jerry Lee Lewis performing in 2010. The music scene all started with Sam Phillips and his understanding of the potential popularity and success of the energetic Afro-American music. He began by recording black singers. Unfortunately racial prejudice was still too strong for them to succeed. Sam then sought a white person with a black style to help cross the racial divide and bring black music to mainstream. This resulted in the "Big Bang" when the musical styles of blues, rhythm and blues, country, gospel and rockabilly music exploded as rock and roll. There is still dispute about which was the first rock and roll song – Miller supplies various suggestions. Sam was against recording gospel songs and ballads as not being commercially viable. This caused some friction. Cash and Perkins left Sun because of this to join other recording labels. The low royalty payments of 3% were another bone of contention. Because the tapes weren’t turned on until later, Miller reconstructs what might have been sung. After taping started, there were quite a few gospel songs and ballads. Issues raised and how much do they matter? - What was sung before taping started? Miller spends some time reconstructing possible songs. - When reconstructing songs, how far does personal memory affect the choices? Carl and Johnny’s version of events differ considerably. - The tape contains sounds of doors opening and shutting. People came and went. - Who was actually present at the session? - Who was playing which instruments at any one time? - How long was Johnny Cash there? If we don’t hear Johnny Cash’s voice much, does that mean he wasn’t there playing the guitar? Did he sing before the tape was running? Is it fair to say that this session should be re-named The Million Dollar Trio? - Did Elvis leave and come back again, then leave? - Once Elvis left, Jerry Lee took over. Jerry Lee was probably there because Sam appreciated his expertise on the piano and wanted an exciting background to Carl’s songs. *** Is there too much time dedicated to conjecture? ... The photographs confirm that Johnny Cash was there and (photgrapher) Johnson's comments raise a strong presumption that he sang. However, despite extensive expert analysis, no trace of Johnny Cash's voice has ever been found on the tapes of the session which were subsequently released on various bootlegs and official LPs and CDs. Johnny Cash claimed in his 1997 autobiography that he was "the first to arrive and the last to leave" but there is virtually no support for this view elsewhere. Carl Perkins, interviewed in 1981, said the group should have been called the "Million Dollar Trio" because Johnny came in for the photographs and possibly to collect some money, and then left to go shopping - with his wife, Vivian. One report claimed that he left because he had to go and collect Vivian from work but this is unlikely since she had two very young children and would almost certainly not have gone out to work at that time. Yet another report claimed that Vivian had accompanied Johnny to the studio with Rosanne, the first of their four daughters. Whatever the truth, none of this precludes the possibility, indeed the likelihood, that Johnny did sing for a while before the photographs were taken and the tapes switched on. Yet it is strange that Carl Perkins, who said he recalled the day "vividly", should be so certain that Johnny did not sing at all. The Million Dollar Quartet has been resurrected as a very successful stage musical which has been played variously in Broadway, Chicago, London and an across-America tour over several years. It’s even been taken to Japan. At the same time, it doesn’t reflect the original session accurately: it’s been changed to show the history of Sun Studio over one year condensed into one evening’s entertainment. The selection of songs has been altered because there were too many gospel songs and ballads in the original. While Sam Phillips is played by an actor, all musicians have been selected as real musicians who may or may not be able to read sheet music but can maintain the integrity of the original rough-and-raw sound without orchestral backing. The Quartet hasn’t affected the development of rock and roll. It is significant because: "it continues to resonate with large numbers of people old and young and is an established part of the cultural landscape of the world". The Beatles met Elvis at his Bel Air home in Los Angeles, California, on August 27, 1965. After an awkward beginning, they had a jam session that wasn’t recorded. Priscilla Presley was there and has reported on it elsewhere. Just as The Million Dollar Quartet didn’t affect the history of rock and roll music, the meeting of Elvis and The Beatles didn’t change anything either. It could have been very interesting if recorded. There already is a musical show Elvis Meets The Beatles – which appeals to fans of both Elvis and the Beatles, just as The Million Dollar Quartet has appeal for fans of Elvis, Johnny Cash, Jerry Lee Lewis and Carl Perkins. The "Class of '55" quartet with Roy Orbison taking Elvis' place - as featured in the 'Reunions' chapter. If you are already familiar with The Million Dollar Quartet, some of the information in this book may be redundant. There seems to be too much repetition and conjecture padding out the book. However, it does bring together, synthesize and discuss various points of view. It remains a good source of information and discussion of this historical meeting of the key people who launched the "Big Bang" of rock and roll. Who Is The Greatest: Elvis or The Beatles? "Growing Up With the Memphis Flash"
'The Seeker King' - Book Review: A woman in the audience once handed Elvis a crown saying, "You're the King." "No, honey," Elvis replied. "There is only one king -- Jesus Christ. I'm just a singer." 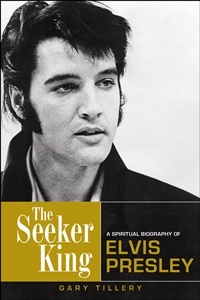 In his 2013 book 'The Seeker King: a spiritual biography of Elvis Presley' author Gary Tillery presents a coherent view of Elvis's thoughts through such anecdotes and other recorded facts. Elvis came to believe that the Christ shines in everyone and that God wanted him to use his light to uplift people. And so he did. Elvis's excesses were as legendary as his generosity, yet, despite his lethal reliance on drugs, he remained ever spiritually curious. This intimate, objective portrait inspires new admiration for the flawed but exceptional man who said, "All I want is to know and experience God. I'm a searcher, that's what I'm all about." EIN book reviewer Susan MacDougall explores this interesting book and questions that since so much has been written about Elvis' including at least a dozen books about his spiritual search, is there anything new to say? Go here to read her detailed review to find out! 'The Death and Resurrection of Elvis Presley' - Book Review: Elvis Aaron Presley is more popular today than ever, yet he died nearly forty years ago. His music is constantly remixed and re-released to a new generation of fans, and his image thrives in popular art and culture. Elvis is the subject of some truly astonishing rumours and legends, including the one that he never actually died. 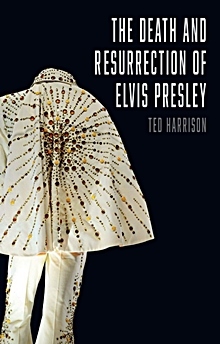 In the new book, The Death and Resurrection of Elvis Presley, author Ted Harrison asks what lies behind the remarkable resurrection in popular culture of the King of Rock 'n' Roll. It tells the story of Elvis after Elvis. It shows how his estate, which was pillaged by his manager, was saved through the business acumen and financial vision of his ex-wife Priscilla Presley. It explores a spiritual dimension to the Elvis revival, where fans create a fantasy quasi-religion through which they blend and confuse Elvis and Jesus. Published in 2016 this is a thoroughly researched book that brings us up-to-date with recent developments. Harrison draws on existing publications on the same topic, as well as websites and correspondence, conversations and interviews with many Elvis fans and associates conducted over 25 years, to make a well-argued case. He finally proposes possible future directions for this extraordinary Elvis phenomenon. Go here as EIN book review Susan MacDougall explores this fascinating book and decides whether Elvis fans need to discover what the myth is all about. promised an "intimate portrait of Elvis Presley, America’s favorite music idol, chronicling his remarkable life from a dirt-poor schoolboy in Memphis through his rise as a Rock n’ Roll superstar to his final days in Las Vegas. Drawing on exclusive interviews with Elvis’s closest friends and new documentary evidence, this biography reveals secrets about his relationships with his addictive mother Gladys, his ruthless manager Colonel Tom Parker, his musical rivals The Beatles, and the truth behind his marriage to Priscilla Beaulieu." EIN reviewer Susan MacDougall checks out this old classic to see how it stands the test of time, look at some of the interesting issues addressed and investigates how the book sees Elvis as a "person" rather than an image. 'Nashville Chrome' - Book Review: In the late fifties the Country Music group The Browns - Maxine, Bonnie, and Jim Ed - were enjoying unprecedented international success, rivaled only by their longtime friend Elvis Presley. 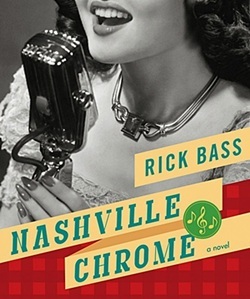 The book 'Nashville Chrome' by author Rick Bass presents a vivid evocation of an era in American music, while at its heart it is a wrenching meditation on the complexities of fame and of one family who experienced them firsthand. Just two months ago it was announced that The Browns would be inducted into Country Music Hall of Fame. With immaculate timing, EIN contributor Susan McDougall reviews the 2010 publication 'Nashville Chrome' about this fascinating group. 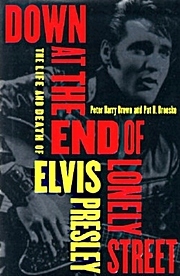 The connection between The Browns and Elvis is an intersting topic - and as always Susan presents both the positives and negatives about publishing a book about such a well-researched period.